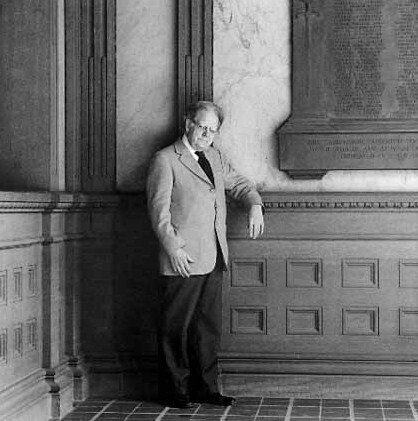 For the last four years I have been preparing for eventual publication a large-scale compilation that has the working title “The Northrop Frye Quote Book.” It will consist of some 4,000 alphabetically arranged quotations, the texts of which are taken from the Collected Works. I would like to correspond with FOF (Friends of Frye) who wish to draw my attention to remarks that should appear in this collection. Included will be aphoristic expressions but also passages of two or three sentences in length that, while far from being aphoristic, make strikingly odd though often obvious points. Already I have some 3,500 such remarks in place, but the man is so quotable I may have missed your favourite formulations. I would love to know about them. I am currently an Associate of the NF Centre at Victoria College. My website is www. colombo – plus. ca and my email address is jrc @ ca . inter. net. This entry was posted in Guest Bloggers, News on November 18, 2009 by Guest Blogger. Being lucky means something very wrong in a world where many are not. I have a stack of index cards about 2 inches high, each with a quote by Frye on it. These were the core of my intellectual, moral, imaginative, and spiritual education for many years. Here are a few. I can provide more if you like. So the reasonable is being favorably contrasted here with a militant rationalism. The context is the intolerant attitude of Christianity, when it refuses to “soft-pedal” the exclusiveness of its own revelation, towards other forms of revealed or demonstrated truth. I agree very much with your position on the matter, as I agree with the kind of position taken by Thoreau in his time against slavery. It is more a matter of clarifying the issue for myself. I would be interested, for my own edification, to know what you think: at what point do we decide that the reasonable attitude, which we cherish for its ability to dialogue and effect those reforms which are within the realm of the possible, has in fact become unreasonable. It is interesting that Williams’s apparent strategy is not unlike the “reasonable” posture, on a number of issues (gay rights being one of them), adopted by Obama to effect reform: compromise, halfway measures, illogical agreements. Ed Lemond alluded to this, I believe, in his previous post. Frye makes the statement in slightly different formulations in several places, and as early as his Canadian Forum period. Northrop Frye Unbuttoned (Anansi, 2004) contains hundreds of pithy, profound, irreverent, humorous, epigrammatic, and otherwise memorable quotations, drawn largely from Frye’s diaries and notebooks. Fee free to steal any of those. Thanks Joe, for bringing up this topic again. Certainly Rowan Williams is the epitome of “mature human intelligence.” He says in _Where God Happens_ that “one of the most obvious characteristics of the church ought ot be a willingness to abandon anything like competitive virtue (or competitive suffering or competitive victimage, competitive tolerance or competitive intolerance or whatever).” I’ve sometimes noticed a “competitive reasonableness” in the Anglican church that is used as a cudgel to silence people with a real grievance. Anything can be used as an idol, anything can be used as a weapon, including charity, including God, including reasonableness. One of the teachings of Christianity is that revelation is denied to the wise (i.e. the mature human intelligence) and given to the child, that the beginner’s mind of a child is the only way to enter the Kingdom. The child knows very little but she knows that some things are right and some things are wrong, and she knows that some things are true and some things are lies. She knows that a lie is wrong and wrong means bad. If you tell a lie against someone, you will hurt them. And if someone is hurting another person, you should stop them if you can. There is a strain of Christianity in the U.S. that is hard to distinguish from fascism, and its main weapon is homophobia. It is being actively and systematically exported to Africa and Asia where it is unfortunately finding a very large receptive audience. It is not possible to tolerate fascism. Your choices are to give in to it or to fight it. Sometimes you have to choose a side. Sometimes the situation is black and white. It is not that I am giving up on homophobes or want to exclude them from the Church or the body of Christ, but I recognize what human freedom is and has always been, the power to gratuitously turn your neighbour into your enemy. The whole delight of people who do such things is in destroying. Not giving up on these people doesn’t mean keeping dialogue open with them, it means fighting them with all the legitimate power God gives us, but knowing that ultimately they are in the hands of a God who is Love. I noticed that Williams was off to see the Pope last week in an effort to ease the tensions over the Pope’s recent invitation to disaffected Anglicans to return to the true church. The disaffected who are being targeted are the misognynists and homophobes who, for all Williams’ efforts to preserve the Church rather than defend the Gospel, can never be satisfied, because they are not interested in dialogue in the first place. As for Caiaphas, it seems to me that you can look at crucifixion ironically or you can look at it in horror. Frye clearly sees it ironically, at least in the passages you quote, and that is certainly more in line with the comfortable religion that he is describing in The Double Vision. Horror, at a far enough remove, is irony. Getting away from horror is certainly a fine goal, but that’s different from denying its reality. I tend to think horror is real. Horror is the human will hell bent on destruction. All this reminds me of another quote by Frye, “enlarging the scope of dialogue is easiest for the most indifferent.” Dialogue is great, of course, but if the words that are being said are not being taken seriously, not being taken to heart, not being tested for truth, not being acted upon, then dialogue is futile. How do I know that Rowan Williams is doing something wrong? How do I know that his “reasonableness” has gone too far? Because I can’t believe that he doesn’t know that the official position of the Anglican Communion against gay “acts” in fact is the foundation of Christian homophobia, and therefore all the persecutions that arise from Christian homophobia. If he doesn’t see that fruit of that doctrine is black and rotten and stinking, then I am wrong in my blaming of him, but I am also wrong in my respect for him. I’ve spent my career at Cape Breton University, a small, fledgling university, once the Sydney campus of St. Francis Xavier University. I’ve been here from the time, in the mid-70s, when we struggled to break free of the mother university until now when we offer our own B.A. and B.Sc. degrees. “The educational market functions like all other aspects of the market. It’s centered in populous and wealthy areas like those of Harvard or Chicago or Berkeley, and it ripples out from there until it reaches the youngest, most remote, and most vulnerable seats of learning. The easy way to look at this situation is the cop-out way, to think of a new university as one where students go because they can’t afford to go somewhere more central, and where the staff remains only because the employment situation is too bad to let them move somewhere more central. Such an attitude would kill any university, and would have killed Harvard or Chicago or Berkeley, if it had got there early enough. Thanks for this, Richard. Frye says, as you do here, that in the humanities the only authority that means anything in the classroom is not the teacher but the subject matter itself: “The kind of authority that the university is interested in is the authority which is inherent in the subject being studied: the authority of the fruitful hypothesis as opposed to the crackpot notion; the authority of the great imaginative classic as contrasted with the mediocre or the merely sensational” (“The Social Importance of Literature,” CW: 331-32). Wherever we are, we are all fighting the same mental fight on the same front line.